Contents: 3 Videos (DVD) and 3 manuals shipped to you. online multiple-choice tests. Contents: 3 online Vides (DVD), 3 online manuals and 3 online multiple-choice tests. Contents: 3 Videos (DVD), 3 manuals and workbooks with multiple-choice tests shipped to you. 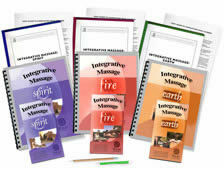 Already own the Integrative Massage Earth, Fire or Spirit DVDs? Call us at 1-800-364-5722, 9am to 5pm, to discuss your enrollment options. Learn all three routines and begin creating your own Integrative Approach to therapy. Use this massage routine to help ground your clients into a body that is free from fascial restrictions created from physical and mental tension. The Earth Massage routine presented in the video integrates massage techniques from Deep Tissue Therapy, Neuromuscular Therapy, Myofascial Release and Swedish Massage. Using the side posture primarily, the Earth Massage routine employs deep, compressive techniques that soften adhesions and muscle fibrosis, reducing the activity of myofascial trigger points, increasing the mobility of connective tissue and joints, and improving posture. This massage is most beneficial for anyone who has limited vitality due to excessive stress. The Fire Massage routine presented in the video integrates massage techniques from Sports Massage, Active Resistance Stretching, Neurolymphatic Reflex Massage, Breath Work, Deep Tissue Therapy and Swedish Massage. The Fire Massage is a revitalizing and rejuvenating massage designed to loosen blocks, relieve stress and energize the body. The Spirit Massage routine presented in the video integrates massage techniques from Manual Lymphatic Drainage Massage, Myofascial Release, Guided Imagery, Energy Balancing and Swedish Massage. The Spirit Massage is designed to quiet the mind and to get the receiver in touch with their own inner healing rhythms. Gentle, energy-based techniques, coupled with guided imagery, induce a meditative state where excessive mental 'noise' is quieted and a sense of inner balance and harmony is attained. Keep in mind you don't have to complete all three courses at once. Enroll in the collection for additional savings, but complete the courses individually. This is an excellent way of presentation. This study will help me in my future practice because of its contents and unique way of understanding using different modalities. I have always been enlightened by the courses at IIHS; you wrap the package in a way that brings beauty to the content of the gift, the remarkable resilient human being. Thank you and I love being able to go over the material again and again. This course exceeded my expectations. I have changed my massage routine for the better. Yes it only took me a few hours to read the text and take the quiz, but to watch the DVD and for integrating the technique smoothly into my routine, it took several more. I love this massage; it works well with my hot stones and allows meditative focus. Thanks! This was a great course for me to add some FIRE to my OWN practice! After 15 years of practicing massage therapy, I have been concerned about burning out. Your thoughtful and comprehensive course has given me a wonderful new approach to treatment for the many clients I work on suffering from stress and burn-out. I look forward to integrating this work into my repertoire of modalities. Thank you! This course was very well done and demonstrated clearly where this profession is heading - integrating bodywork techniques from many different modalities. To treat the whole patient, a practitioner needs to be well trained and proficient in many different areas. I also appreciate how your courses bring the provider and the receiver together making a treatment highly effective. Keep up the good work! Very valuable and useful tools presented. 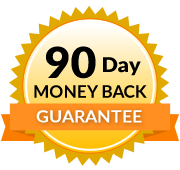 I was very impressed with Jenny Wilmer she was concise and at the same time very smooth. I especially liked her preparation on the breathing and meditation she did. I wish I had her for one of my teachers in school. She is an asset for you. I really needed this course because I like light massage and wanted to learn guided imagery for a long time. I have done some work in acupressure and Reiki. I love energy work. Your integrative massage was super. Thank you. I love the elements and flow of the spirit massage! I am experiencing a more profound healing connection with my clients than ever before. Thank you for this wonderfully refreshing integrative approach! Excellent course however I already practice a great deal of the content but did learn a couple things I didn't practice in my massage. Great Course :0) Love Earth, Fire, Spirit collection. I enjoyed reading thru the course material. I have studied a blend of modalities in the past and this course brought them all together. The DVD enhanced the course. A style I will use often with my own. Awesome!!! 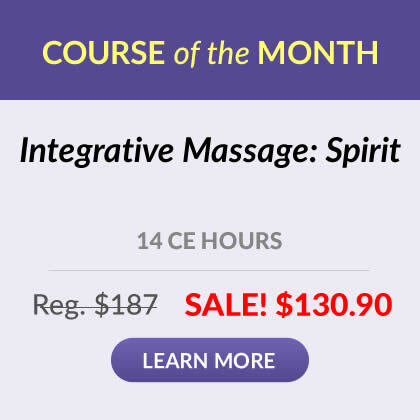 I have been a Massage Therapist for 15 years and found this course to be interesting and informative. I am excited to begin using these techniques in my practice. Thank you for providing high quality continuing education courses! Reviewed video several times to better understand techniques. Quite a lot presented in this course. Also loved the grouping of the 3 courses (Earth, Spirit, Fire). Could see use of techniques from all 3 for various situations. Found I had more questions in this one and had to review several times to make sure I was understanding correctly. As always, seeing helps clear things up, but hands-on is always the defining factor. The videos are very thorough and at a realistic pace to a session, adding good explanations as you go along and suggestions of alternate techniques along with reasons. You get a good understanding of the results of this type of session. Thanks! I was concerned about not being in a class room setting, but this is extremely easy to follow and understand. Have been a therapist for 20 years and fulfilling CE requirements has taken second place to the fascinating, never-ending quest to understand the body. I enjoy these courses not only for the information but that I can do it when my brain and time are “available” to learn/absorb without interruption, distractions, time constraints, or stress! Every course book becomes a reference! These courses keep me current, refresh my memory, and add to my clients understanding and improvements as well!